I’ve heard so much about how healthy the Mediterranean diet is because it is comprised of all natural plant-based foods and healthy fats like olive oil. 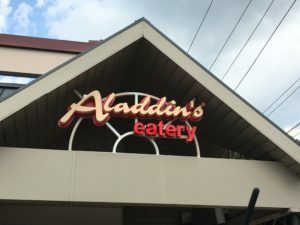 And today I had the pleasure of visiting an authentic Mediterranean restaurant, Aladdin’s Eatery, located in Grandview, and learned how delightfully healthy this type of cuisine can be. 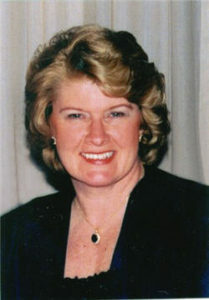 The dining room is quite comfortable, but on a beautiful summer day my friend Pat and I sat outside on the patio and watched the hustle and bustle of passing bikers, joggers and shoppers. We both had the Turkey Salad with slices of spiced roasted turkey, a generous portion of fresh greens, sliced cucumber, scallions, tomatoes, calamata olives topped with feta cheese and a fine blend of olive oil and herbs. The turkey was quite tasty and tender without being too spicy, and the green salad was a perfect complement. The freshly brewed Pomegranate green tea sweetened with stevia, was refreshing during the heat of the day. 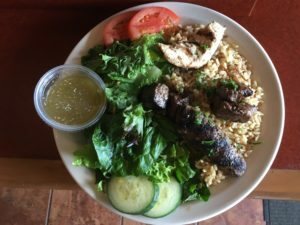 During my next visit I want to try the variety plate that features authentic Mediterranean Beef Kafta, Shish Kabob and Shish Tawook served with seasoned brown rice along with a side of greens. Sounds like a great culinary adventure. All dishes are served with fresh ingredients and healthy sides like fresh Hummus or Falafel. And for those with specialized tastes, vegan, vegetarian and gluten free dishes are available. A perfect meal is when you still have room for dessert, and Aladdin’s hits a home run in this department. They feature a variety of desserts, all homemade, including Baklava, cheesecake, and scrumptious gourmet cakes. Just the right touch to finish off a good meal! 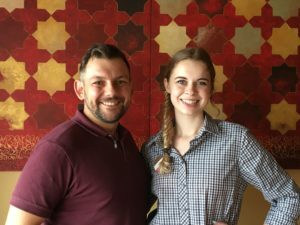 Check out Aladdin’s Eatery at 1425 Grandview Avenue when you’re in Grandview and ask for Dustin or our exceptional server Karli.